Bring 1 cup cream and 3 tsp of Vanilla Press’d Coffee to simmer in heavy small saucepan. Remove from heat; cover and let steep at least 20 minutes and up to 1 hour. Sprinkle top of each custard with 1 teaspoon dark brown sugar. Using kitchen torch, melt sugar on each custard until deep amber. (Alternatively, preheat broiler. Arrange custards on small rimmed baking sheet; broil until sugar topping melts and browns, about 2 minutes.) 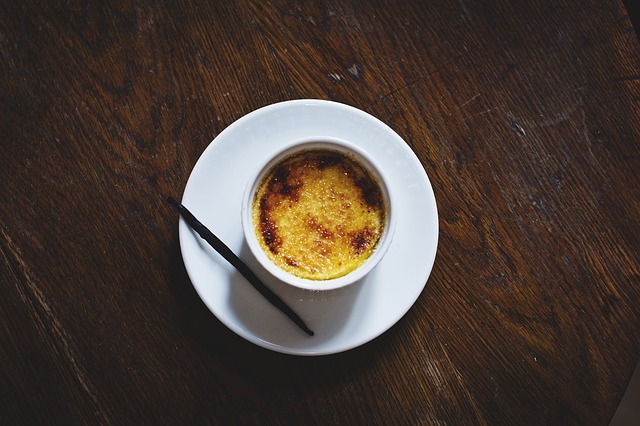 Refrigerate custards until sugar topping hardens, at least 30 minutes and up to 1 hour (do not chill longer than 1 hour or topping will start to soften). Serve custards cold.